I'm not the world's biggest Marvel vs. Capcom fan -- I prefer Street Fighter's comparatively slow-and-steady pace to what I often describe as "a bunch of insane stuff flying all over the screen for the entire match" -- but one particular addition to Ultimate Marvel vs. Capcom 3's roster has me excited. The character in question: None other than ace attorney Phoenix Wright, who's made the jump from his own niche Nintendo DS courtroom adventure series to one of Capcom's biggest fighting game franchises. Ace Attorney diehards know that Capcom's considered putting the quirky lawyer in the ring before now. Wright was a candidate for inclusion in 2010's Tatsunoko vs. Capcom: Ultimate All-Stars, eventually getting sidelined due to perceived balance issues (reportedly, his trademark "OBJECTION! "s differing lengths in English and Japanese) and a struggle to settle on a workable design (early ideas even had him fighting from behind a mobile desk). But it seems that Capcom's found ways to insert him into the MvC3 canon while retaining many of his oddball characteristics. "He's about ridiculousness, and he's about being faithful to the Phoenix Wright games," Ultimate MvC3 Special Combat Advisor and noted fighting game virtuoso Seth Killian told me as he demonstrated the two stances that Wright dances between during combat. True to form, Wright's Investigation Mode stance finds him literally searching the battlefield for evidence, populating an onscreen trio of inventory slots with random mundane objects. "Good" and "bad" evidence highlight in different colors; Wright can weaponize useless evidence, chucking it at opponents and clearing valuable inventory space. The overall goal is to lock down three pieces of solid evidence -- and Wright's got an array of special moves, such as calling out his mystical assistant Maya Fey to act as something of an energy shield and barricade, to buy time for evidence searches. The Courtroom Mode stance presents its own wealth of options, including a super combo that calls down a judge's gavel to pummel the opponent, and a "HOLD IT!" word bubble projectile. Once Wright's assembled his body of evidence, this move changes to the trademark "OBJECTION!" -- and landing this attack enables the so-called "Finger of Doom," a full-screen projectile (limited by its own special meter) that can juggle foes for a number of successive hits. And it's available for use for long as an evidence-enabled Wright successfully connects with his "OBJECTION!" move. Ouch! 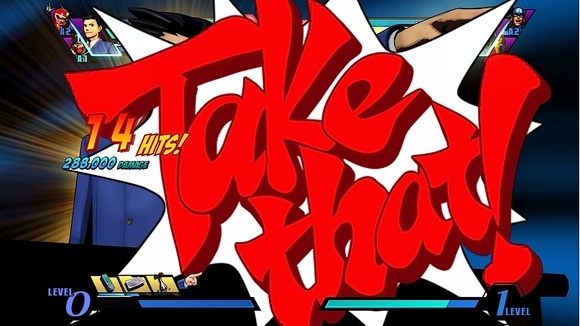 But the real allure of all this evidence-collecting is that it (along with the proper amount of super meter, of course) enables Wright's level 3 Conviction hyper combo, in which he presents the objects to secure a guilty verdict (or, in Marvel vs. Capcom 3 terms, "a whole lot of damage") for his opponent. According to Killian, Conviction deals more damage than any other hyper combo in the game. So, is Phoenix Wright a joke character -- a la Street Fighter IV's dopey Dan -- or is he a legitimate force to reckon with? "Far be it from me to call tier lists before a game is released, but I think he's up there," Killian told me. "There's a bit of a luck factor, but if you can get that evidence, there's no question that Phoenix Wright is one of the very strongest characters in the game." It's good to see that Capcom's successfully introduced one of its most unique characters into its fighting game canon. Take that, Magneto!